Creamy Nothing says warmth more than this Macaroni and Cheese recipe. 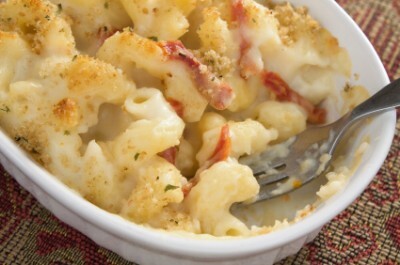 If you love mac and cheese then you’ll definitely want to try something different. This recipe is made with some great Italian cheeses mixed with a few surprises like sun-dried tomatoes and a little garlic. It’s a great twist on an American classic. Macaroni and Cheese is comfort food at it’s best. Once you’ve tried this recipe you’ll never go back to regular mac and cheese. It’s a great dish that’s perfect for every occasion. In a 6 quarts of boiling salted water, cook the pasta to almost al dente, About 5 minutes. Drain the pasta and place into a large bowl. Meanwhile in a large saucepan melt the butter and sauté the garlic for 1 minute. Slowly stir in the cream until it begins to thicken. Stir in the nutmeg and mozzarella. Add the fontina, provolone and sun dried tomatoes. Mix the cheese mixture with the macaroni, season with salt and pepper and place in a large buttered casserole dish. Sprinkle the breadcrumb mixture on top of the macaroni and bake for 10 minutes until golden.